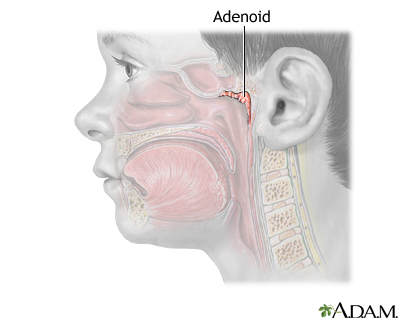 The adenoids (lymphatic tissue in the back of the throat), along with the tonsils, comprise the Waldeyer ring. 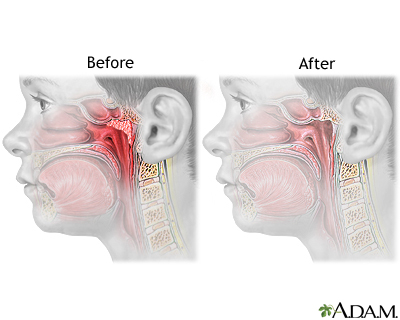 Adenoidectomy may be recommended if the child has chronic or repeated bouts of tonsillitis. 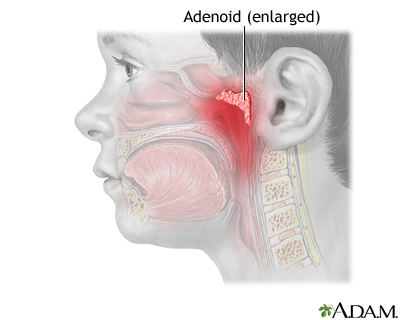 The adenoids normally shrink as the child reaches adolescence and adenoidectomy is rarely needed after reaching the teenage years. While the child is deep asleep and pain-free (using general anesthesia), a breathing tube is inserted into the child's mouth and throat. A small instrument is inserted into the mouth to prop it open. 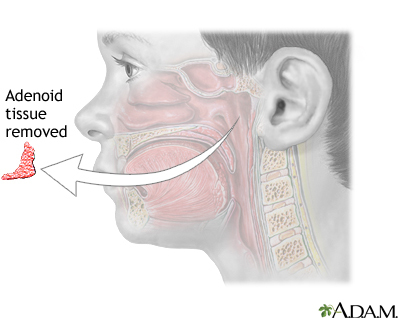 The adenoid tissue is removed and bleeding is controlled. Adenoidectomy is usually done as an outpatient procedure. Complete recovery takes 1 to 2 weeks. While healing, the child may have a stuffy nose, nasal drainage, and a sore throat. Soft, cool foods and drinks may help relieve throat discomfort.